Inside a deep and extremely dark forest, two witch sisters live together with their black cat and a clairvoyant owl. During the day they are out on the village streets and at night you will find them in their stone house where they brew magic formulas. Their task is to find a way to cure all illnesses, using a crystal ball as an aid. A witch is often said to be a woman who possesses supernatural powers. In many cases witches are associated with negative conditions when some myths mean that a witch was a woman who sold her soul to the devil in exchange for supernatural powers. The poet William Shakespeare wrote, among other things, the immensely popular drama "MacBeth", where witches are boiling a cauldron as they perform their magic rites. However, unlike MacBeth’s witches, we are absolutely convinced that the witches are good, and we will prove that together with FUGA Gaming Technologies in the Witchcraft Video Slot. As soon as you enter the Witchcraft Video Slot you will meet with a lush, mysterious forest. The game interface is placed in the middle of the screen and has a classic layout, meaning it consists of five reels and three rows. There are 40 paylines that determine winnings from left to right in the picture. Before you can start off on this exciting adventure, you need to set the bet value (that is, the amount you want to bet) and you can easily do this through the arrows next to the text "TOTAL BET" display. The minimum wager amount is of € 0.4 and can go up to € 80. It is also through the control panel that you can set the game to play in autospin mode. 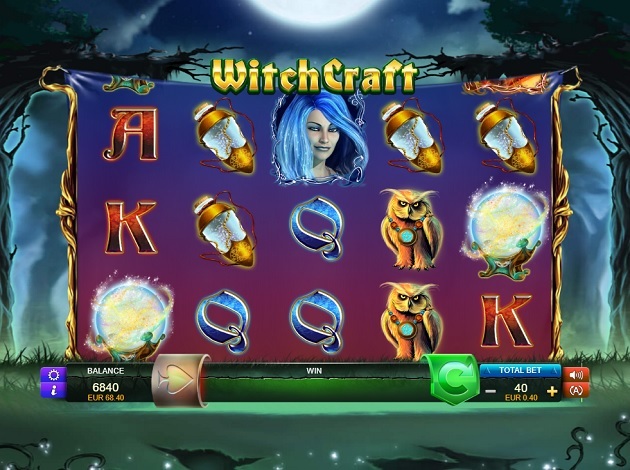 The witches in the Witchcraft Video Slot certainly have magic powers, and have the chance to trigger some of the most significant features such as respins and secret prizes. Initially, respins are triggered when three or more Fire Witch symbols land on the reel set. Before the feature starts, the Witch will transform herself into a Secret Symbol, Multi Wild or Stacked Wild. Secret Symbol: Here the Fire Witch has the ability to turn random icons into higher paying symbols to help create winning combinations. Multi Wild: The witch transforms into a Wild and gives you a Bonus Multiplier of 3x, 5x and 7x your wager amount. Wild Stacks: On any reel, the Fire Witches can land stacked to increase your winning chances. Also, keep in mind that Wild symbols, just like they do normally do, replace other icons. There cannot be a Fire Witch without an Ice Witch, and in the Witchcraft Video Slot, she has the ability to trigger the Bonus Feature whenever she appears in three positions on the second, third and fourth reels. Here is your task to find two parts of a sword, a maiden, a magician or an eye - if you succeed in the task you get a "Super Prize." The golden Pentagram placed against a black background can land on the third reel and replace with an adjacent symbol, as long as this symbol pays a higher amount for an even better win amount. As mentioned earlier, there are 40 paylines that can earn you winnings from left to right side on the lines. At least three matching symbols need to land on a payline to score a win, and the amount you receive depends on the amount you bet and the specific value of the symbols. In the payout table you will find classic card suits (A, K, Q and J) that give out lower payouts. Flying brooms, boiling pots, luminous necklaces, black cats and the owls offer medium payouts, while the crystal balls are the highest payout symbol of this video slot. FUGA Gaming Technologies has collaborated and created a well-designed cartoon game with powerful animations. The images are reproduced clearly, making the symbols very easy to appreciate! Have a closer look at the magic sphere that exists in the Witchcraft Video Slot! FUGA Gaming Technologies has not only succeeded in creating a captivating theme, but also packing it with intriguing and benevolent features. Now that you have a clear insight, you just have to try the game for yourself and get spinning. Good luck! 20 years’ experience, over 75 games, and 24 major projects – only three of the marvellous qualities that make this game provider truly stand out. This is one developer offering games to a number of big operators in the iGaming business around the world – this is FUGA Gaming Technologies! FUGA Gaming Technologies is a company founded by a group of people with extensive experience in the gaming business, basically veterans in the industry. It is a young company, offering a fresh take on games and their production. FUGA Gaming Technologies is a British wide range gaming software provider that has clients on both sides of the Atlantic. The products offered by FUGA Gaming Technologies are all created in-house by a highly experienced development team of professionals. They put their main focus and directions on creating quality products, as well as being efficient, and achieving great results. Every detail in the making of products at FUGA Gaming Technologies matters and everything is rigorously controlled. This makes sure that each and every time a product is created and delivered, it is done flawlessly and suited perfectly to the clients’ wish.